All the instructions will be the same for future years, for this year, search for giftalong2018. This is a great unisex hat and men to do seem to absolutely love it. It has enough detail on the crown shaping (whi ch has a couple of options) to keep the knitter happy but has clean, crisp designs lines that men love for sophisticated simplicity. It’s made using worsted weight yarn and the lower part of the hat uses a simple ribbing pattern. The crown decreases add a bit of interest and magic. A few friends of mine tested this pattern and can attest to how well written it is. All the main numbers are contained in a clear, easy to follow table and you just move to ‘your size’ as needed. It’d look great in a worsted or aran weight yarn and I’m sure the men in your life would love it. It’s a quick knit, a couple of evenings knitting for me, at most. I’d recommend it as a quick gift knit, particularly for men. I fell in love with these and they are supposed to be a gift, but I think I’ll be keeping them (no pun intended), so sorry Mum, you’ll get something else this year. These are also made with worsted yarn but at a tighter gauge/tension for warmth and to keep out the wind on cold days. The honeycomb like texture pattern is very easy to memorize. The palm has a slip stitch pattern to give it warmth and some strength to the fabric, in the same way you’d do on the heel of a sock. It’s very well written with clear charts (and written instructions for those who don’t get on with charts). I’m using Grouse, a mid grey for the cuffs and Blueberry, a rich purple for the body of the mittens. I don’t make toys, absolutely not patience for small, fiddly things and yet I fell in love with these guys. I’ve made two alr eady. I just need to finish the beard, nose and arms for the second one. 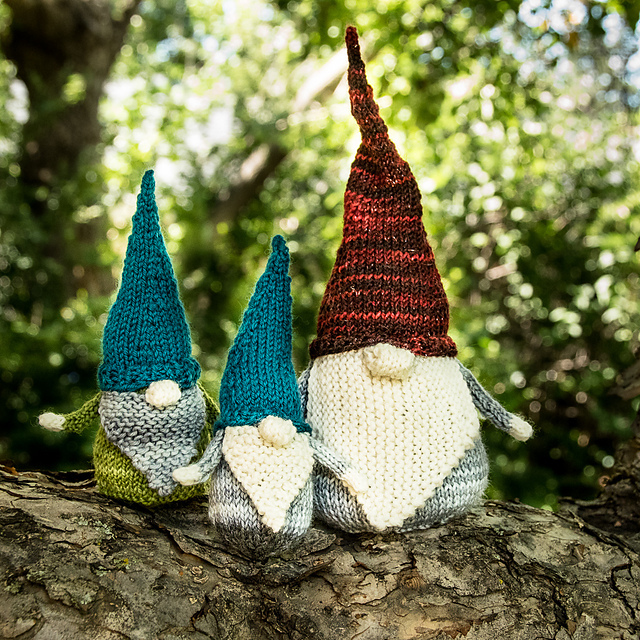 Other Ravelry members have made the small, medium, large and there is one super bulky egnormous Gnome so far. Many projects have been themed by characters, mine is Gnomedalf the Grey. I’m working on Sherlock Gnomes and trying to figure out how to make the deerstalker hat. Do check out Dogwood13’s projects, hers are adorable. My good friend bluesocks has also made a couple and one of her Gnomes is pictured with various books (hilarious titles). I was really tired and needed a warm, smooshly scarf. This knitted up very quickly, I missed the cables as I really wasn’t awake enough to pay attention an d wanted a much wider scarf. If you check out the other projects, they cables really do make it. I also recommend, if you can find it or it’s in your budget, use the Malabrigo Nube yarn for the pom pom, they’re adorable. I love Denise’s designs and have had this in my library for a while (the magazine version). I love the way it works with a self striping yarn and various crochet lace stitch patterns to create a chic and stylish poncho. If you’d like to browse the Ravelry Bundle of all the eligible patterns for the Gift Along, follow this link.